There is still time to make sure your favorite small business related book is nominated (or your own!) 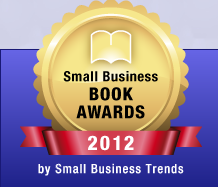 for the Small Business Trends Book Awards – but only until Tuesday, January 31, 2012. Don’t take the chance of being shut out by waiting until the last minute. Head over there NOW and make sure your favorites are listed. If you’re an author that goes double for you. Join all our fellow book lovers including Anita Campbell from @SmallBizTrends and our blogging collaborators @Ileane @mmangen @VernessaTaylor @CoachNotesBlog and many more in a Twitter chat on book promotion. It is bound to be lively and interesting – and you will make some exceptional connections. Published between November 2010 and December 2011. Relevant to small businesses and/or entrepreneurs. Both print and electronic books including PDF books, Kindle books, Google ebooks, and similar electronic formats are eligible – provided they are sold and not given away. Sorry – free versions are NOT eligible to be nominated. Complete Small Biz Book Awards Rules. Voting will begin February 1 and end February 16, 2012. Help us spread the word. Use the sharing buttons at the top of this post. You can edit tweets to say whatever you wish. We’ll see you at the chat! Great! Nevertheless, i will remember it for the next time and hope to be on time then. Thanks for sharing. Thanks for sharing this information. I think that the small business book trend is awesome. Thanks for posting. I have been reading a lot of books, even e-books. Anyway,I wish all of the nominees the best of luck! Thanks for sharing this. Congratulations and good luck to the nominees! Any chance we’ll be able to get a few excerpts from the winning book? I am too late for this now-I wish I’d come up this post some week ago. Nevertheless, i will remember it for the next time and hope to be on time then. Time is money! EleonoraEOF would love you to read ..Are You a Candidate for Bariatric Surgery? I’ll look forward to this event even though the nomination period was already over. These small business books are really deserved to be nominated for their quality and value to the readers. Do you mean in a previous year? Voting hasn’t opened yet for this year – it will on February 1, 2012. The concept of Small business trends book awards is very interesting. Honoring authors in such a way is really motivational for them and also for others. It will inspire them to write more of such useful books. Small business owners are the real winners in this. Getting tips for business from the expertise in the field is truly a great honor. Thanks for sharing this information! All the best to all the nominees! I really appreciate this great information that you have shared with us, to be honest during my early years i don’t really read books, because of the effect of the technology, as I have read this post of yours it provides me good information which I can adopt during reading books. specially when it comes to business . I think we learn more , to become successful marketer soon. Yes! There are too many books which really helps. I have been reading a lot of books, even e-books. Thanks for sharing! There are so many amazing books listed, and every year Anita does an amazing job with organizing the awards. I wish all of the nominees the best of luck! Hi Gail, Small Business Trends always has such great awards to honor the small business community. This is the 4th year for this award and I really honored to be a media partner this year. I nominated a book by David Meerman Scott called Newsjacking: How to Inject your Ideas into a Breaking News Story and Generate Tons of Media Coverage. What I really love about awards like this is that in the end, everyone is a winner because we all get to find out about some awesome books that we might not see otherwise. Ileane would love you to read ..Is Your Blog Post An Essay or A Novel? Thanks for informed us for Small Business Trends Book Awards Nominations. I am also planning to Technology book.